Now that it's cool to care about the Boston Marathon again, Fittish would like to familiarize you with the runners at the front of the pack. 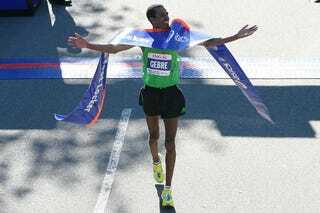 Today's elite: Gebre Gebremariam. So This Is Obviously That Guy They Call "Geb"? : No, you're thinking of the great Haile Gebrselassie. Oh Yeah, He's The One Who Won Silver in the 2012 Olympic 5000m: No, that was Gebremeskal. Jesus Christ, Why Can't The Ethiopians Just Use Different Names Like The Americans? : You mean like Ryan Hall and Ryan Vail and Ryan Shay? Likelihood of Victory: Not Great to Low. The good news is that he has an impressive list of victories in shorter road races, and finished third here in Boston last year. The bad news is that a lot of guys who have an impressive list of victories in shorter races make a career of third and fourth place finishes in the marathon. Even worse, most great distance runners only have seven to ten years at the top, and Gebre seems like one of those guys whose clock started ticking as a teenager. He hasn't won a marathon since his surprise debut victory in New York, so there's no reason to think he'll win this. Predicted Finish: Third or Fourth. Fun Fact: If you get to the final puzzle on the Ethiopian version of Wheel of Fortune, they spot you "Gebre."